Visit places off the beaten track, enjoy Dutch culture & art from then and now, meet the locals, learn more about the 17the century (the Dutch golden age) and the country that inspired the Founding Fathers and the people from the “Continental Congress” who drafted the USA constitution. Rembrandt…Vermeer …Tulips….Dutch Water management ….Windmills….Vincent van Gogh …Dutch Charter source of American Constitution….Anne Frank…Piet Mondrian…Willem de Kooning…New York = New Amsterdam…Frans Hals…”Dutch” New York: Brooklyn, Wallstreet, Stuyvesant, The Bronx, Staten Island, Harlem, Coney Island, Flushing …”Dutch” Presidents van Buuren,Teddy and Franklin Roosvelt … “Dutch America’s Royal Families” with Vanderbilt, Schermerhorn, Roosevelt and more… Bruce Springsteen, Marlon Brando, Meryl Streep, Johnny Depp, David Crosby and Tim Grimm have Dutch roots too. This day is not officially part of the tour but we strongly recommend you arrive today, take it easy and use the day to recover from your long flight…. And get to know Haarlem a bit. You’ll love the city-centre. 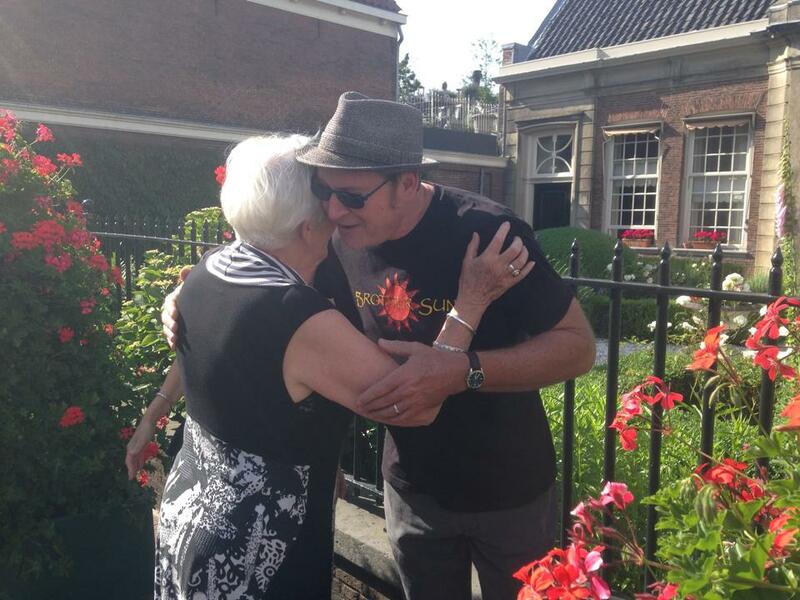 Tim and Jan will arrive in Haarlem today too and Bert will be around most of the day as well. So, if you have questions or want to be pointed in the right direction; we’ll be there! We suggest a joint dinner this evening. This will give you an opportunity to get to know your fellow-travellers and hosts a bit before the tour officially starts. Hope you had a good night sleep and are in good shape to start the Turning Point Tour 2019. We’ll meet between 10:30 and 11 AM have a cup of coffee, tea or whatever and walk to the river Spaarne where our friend Jeroen will be waiting for us with his sloop to take us through the canals of Haarlem and show us the city from a skipper’s point of view. The tour will take about 75 minutes. 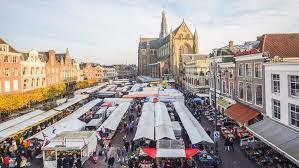 Back on Haarlem’s soil you’ll free to do whatever you want till the agreed meeting time – have lunch, visit the market on Haarlem’s main square or just wonder around in Haarlem’s picturesque city centre till when we’ll meet again. Beer brewing was a very important industry in Haarlem. The city was THE major beer producer in the Netherlands. During the Spanish siege (1572 / 1573) there were about 50 brewing companies in the city; while 45 years later in 1620 the city numbered about one hundred breweries. There was another epidemic of the Black Death in 1657, which took a heavy toll in the six months it ravaged the city. From the end of the 17th century the economic situation in the city turned sour, for a long time. In 1752 there were only seven beer breweries left, and in 1820 no breweries were registered in the city anymore. In the 1990s the Stichting Haarlems Biergenootschap revived some of the old recipes under the new Jopen beer brand, that is marketed as a “Haarlem bier”. In 2010 Jopen opened a brewery in a former church in central Haarlem called the Jopenkerk. In 2012 Haarlem gained a new local brewery with Het Uiltje in the which specializes in craft beers. It’s Tim’s (favourite) job the take you there. We’ll meet at 10:30 AM and walk to the Hofje van Noblet. I already spoke to the lovely Anne van de Wetering (who lives in Hofje van Noblet) and we are more than welcome. She promised us access to the Governor’s room again, which is beautiful. The original 18th century LEATHER wallpaper is still there! HOFJE is a Dutch word for a courtyard with almshouses around it. They have existed since the Middle Ages and provided housing for elderly people (mostly women). They were privately funded, and served as a form of social security. In the Netherlands, especially Haarlem, there are still a number of hofjes in use. The Hofje van Noblet almshouse was built in 1761 from the estate of Leonard Noblet and his sisters Sarah and Geertruida, all of whom had no legal next of kin. The courtyard of the houses is built in the garden of the house of the family Noblet that the father of Leonard, Elezar Noblet purchased in 1737. The family came originally from Amsterdam. There were twenty houses. On the east side ten houses for women from Haarlem and on the west side ten houses for women from Amsterdam. These women should have been single their whole life, at least 50 years old and a member of the Dutch Reformed Church. Next on the program is Teylers Museum, almost around the corner. Spend as long as you like in the museum. It closes at 5 PM so you’ll have plenty of time. Teylers Museum is an art, natural history and science museum established in 1778 that was originally founded as a center for contemporary art and science by the cloth merchant and banker Pieter Teyler van der Hulst, who was a Mennonite and follower of the Scottish Enlightenment. The art section of the museum is notable for its extensive collection of old master’s prints and drawings, including 25 works by Michelangelo and nearly the complete graphic work of Rembrandt. You have been promised two dinners from us. Tonight is the first and our suggestion is a cheese fondue at Restaurant In Het Goede Uur (In The Good Hour), one of Haarlem’s oldest restaurants known for its excellent wines and cheeses. And yes Tim, they have beer too. Dutch singer/songwriter JP Den Tex will perform acoustically for you before dinner. 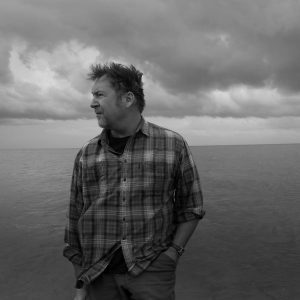 JP Den Tex is a modern-day troubadour and storyteller, mixing up Rock and Americana with European influences such as French chanson. Some pundits have dubbed his music “Beatnik Americana”, referring to JP’s quirky, nomadic brand of Americana. – “They say ‘Beatnik Americana’—I say ‘Top quality adult pop music” (Maverick Magazine / UK). 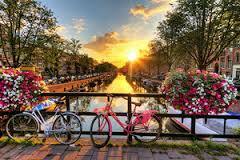 We’ll leave the hotel at 9:30 am, walk to Haarlem Station and take a train to Amsterdam. Upon arrival in Amsterdam we’ll cross the harbour and pay a visit to This Is Holland. This is a virtual flight over Holland. Spectacular but not for the faint hearted! After entering the building you’ll be taken into a small room where a film is shown about Holland, the history, our constant fight against the water, the land reclaimed and the protection built against the water. Next you’ll be taken to a room, dark with a starry sky. You’ll take your seat in a row of seats, fasten your seatbelts, the row of seats moves slightly forward and then “the flight” starts. You’ll fly over Holland, over castles, over lakes, over rivers, (and now the air gets damp) over the sea in a storm (now the air gets really damp, almost wet and the wind blows in your face) over flower fields (now the air smells of flowers). You’ll fly over Bourtange and you’ll fly over The Zaanse Schans (both part of the tour) As I started off: spectacular! After the flight you can wonder around in the next room with displays and explanations of most of the sights you flew over. From the previous trips we learned that to please everybody in Amsterdam is very hard, maybe even impossible, as everybody seem to have different ideas and wishes about what to visit and see in Amsterdam. Therefore we decided to give you a ‘Hop On – Hop Off Bus and Boat Combination Ticket’ and entrance to one ‘attraction of your choice’. That could be the Anne Frank House (which we wholeheartedly recommend) The van Gogh Museum, Rijksmuseum etc. Also very much recommended is the Rembrandt House. Here are some suggestions. The hop on – hop off City sightseeing is the perfect way to experience all the highlights of Amsterdam. With the total 7 stops you will visit the famous sights such The Anne Frank House, Rijksmuseum, Van Gogh museum, the Heineken Experience and past most of Amsterdam top sights such as the Old Port, the Skinny Bridge and the Jordaan district. At the agreed time we meet again, find a place to eat and get a train back to Haarlem. Two history lessons on the program today – one about nobility and one about early industrial developments. Our first destination is Het Muiderslot – Muiderslot Castle. In 1280, Count Floris V built a stone castle along the mouth of the Vecht river after assuming control over the nearby area. At the time, the river was the trade route to the town of Utrecht and was an essential trade town in the Netherlands. With walls as thick as 1.5 meters and only measuring 32 by 35 meters, Muiderslot is a fairly small castle. The moat that surrounded the castle, however, provided extra protection. In 1296, a group of men conspired together to kidnap the count and he would eventually become imprisoned in the castle. After an attempted escape, the count was stabbed 20 times and killed. Just one year after the count’s death, the castle was taken over by the Archbishop of Utrecht and Willem van Mechelen. By the time 1300 came around, the castle had been completely destroyed. One hundred years later, the castle was finally rebuilt in the same location and based on the same plans as the original structure. The new Muiderslot was built by Albert I, Duke of Bavaria. By the end of the 18th century, the castle was being used as a prison before becoming completely abandoned. After falling into ruin, the castle was put up for sale with the intention of demolishing the structure. King William I intervened and prevented the destruction of Muiderslot. It would be another 70 years before enough money was collected to restore the castle. Late morning / early afternoon we will be heading to our second stop of the day; De Zaanse Schans. you finally get to visit a windmill and see how Dutch clogs are being made. This all will happen at the Zaanse Schans, After visiting a windmill or two, having watched how clogs are made etc. there will be a bit of time to walk around and get a taste of how it was when times were when. Today it’s goodbye to Haarlem and hello Hoorn, where we’ll stay for one night. So we’ll check out from the Hotel in Haarlem, jump on the buses and onwards to our first stop which will be a photo-stop at Brederode Castle, just north of Haarlem. Brederode Castle was built in 1282 by Willem van Brederode. The first castle consisted of a bailey and a square keep which probably stood at the present-day courtyard. Its function was to control the through road to the Kennemerland region. Around 1300, the main castle was built with 3 square and 1 round tower at its corners. This castle was besieged and destroyed by the Cod troops under the command of Gijsbert van Nijenrode in 1351. Between 1354 and 1426 Brederode Castle was completely restored on the existing foundations. Until its destruction in 1426 by the people of Haarlem, which mainly damaged the southern part of the castle, Brederode Castle had been the residence of the Lords of Brederode. It took until 1464 before the northern part, which had been less damaged, was again suitable for habitation. The new castle wasn’t a defensible house anymore, but a fairly comfortable residence. In 1491 however, the castle fell prey to plundering German soldi ers and the castle fell into decay. Around 1573, shortly after the siege of the city of Haarlem, Spanish troops set fire to the castle. With that the north wall of the kitchen wing collapsed and fell into the moat. Its debris nowadays forms a little overgrown island in the moat. In the following period only the buildings on the bailey were habitable, but after 1600 these also fell into decay. Then, on our way to Hoorn in West Frisia (West Friesland in Dutch). Before the Middle Ages the area was part of Frisia, the province North East (now) across the IJselmeer, previously called Zuiderzee. That was at the time no more than a wide river but rising water due to climate change drowned the land and it became the (dangerous) Zuiderzee. In the province Frisia they still speak their own language. Bit like Wales in UK. In West Frisia they speak a dialect that is a mix of Frisian and Dutch. Your humble Dutch guide / driver was born on this region and had to learn proper Dutch when he moved to Haarlem at the tender age of 7. Hoorn was probably founded around the year 1200, and quickly gained in importance as a harbour town in the 14th century, developing trade links with the Baltic and Flanders. In 1356 Hoorn became a chartered city, and continued to prosper. It became one the most important and wealthiest towns on the Zuiderzee, competing with Amsterdam. Hoorn’s importance was emphasized in the 17th century as one of the six cities with a chamber of the Dutch East-Indies Trading Company also known as the VOC. Its sister company, the West-Indies Trading Company, more or less owned New Netherlands and New Amsterdam (=New York) on the East Coast of the United States. In the old town centre of Hoorn, you would say downtown I suppose, the wealth of its 17th century merchants is still very much visible from the buildings in which they used to live – By the way; Cape Horn was named after the town when two ships from Hoorn were the first to sail around the southernmost tip of South America in 1616. During the French occupation in the 18th century maintenance of waterways and harbours was neglected which hurt trade and the economy of the Dutch Republic gradually declined. Hoorn and the other VOC cities lost their international trading position. In Hoorn trade from then on focused on agricultural products and cattle. Today Hoorn is more or less a commuter town of Amsterdam with rather boring new suburbs. The city centre, aka downtown, however has largely escaped restructuring and is very well preserved. Rumour has it that your nickname ‘Yankees’ originates from Hoorn. The story is that a family from Hoorn emigrated to the States. They had two sons: Jan and Kees. When mam called her sons she shouted ‘Jan Kees’ which became ‘Yankee’. Upon arrival we’ll check into the hotel, have a bit of lunch and then onwards to the West Frisian Museum in the centre of Hoorn. The museum is housed in a beautiful building from 1632 that was originally the seat of the regional government. Later it became the court house. The museum has an extensive 17th century collection of paintings, silver objects, porcelain, historic objects and firearms.Most of these objects relate to the region and/or to the VOC (East Indian Trading Company) . The collection is exhibited in 25 rooms and part of these rooms reflect life in the 17th century of a certain type of family. So one room shows how a farmer’s family used to live, another a fisherman’s family, a merchant’s family, a governer’s family etc. We call somebody who drinks a lot of alcohol ‘een drankorgel’ (= a drink organ) After our visit to the museum I know where the expression comes from. There actually was such a thing called a drink organ. Basically it was a pile of barrels with taps, held together in a wooden frame. Lots of interesting items and information about 17th century trade, travels and local heroes. Great paintings of masters from our Golden Age too. On 10 January 2005, the night the museum celebrated its 125th anniversary, four people stole 21 paintings of its paintings, including a piece by Jan van Goyen, and part of the silver collection, valued in the millions of Euros. Four of the paintings were found back in Ukraine in April 2016. They have been restored and are now back in the museum. Possibly music tonight too. Today we’ll check out of the hotel and are heading first a bit North and then East. We’ll be driving across the afsluitdijk to get to the other side of the IJselmeer. This is the 32-km long enclosure dam, constructed between 1927 and 1933. It is a fundamental part of the larger Zuiderzee Works, damming off the Zuiderzee, a salt-water inlet of the North Sea, and turning it into the fresh water lake of the IJsselmeer. We will make stop of an hour or so at the brand-new exhibition centre. The main theme at the centre is the survival of the Dutch in the Delta, through the ages and with a view to the future of climate change and sea level rise. The current and future activities on the dike itself can be looked at closely here. From the roof you have view of the IJselmeer on one side and the North Sea on the other side. 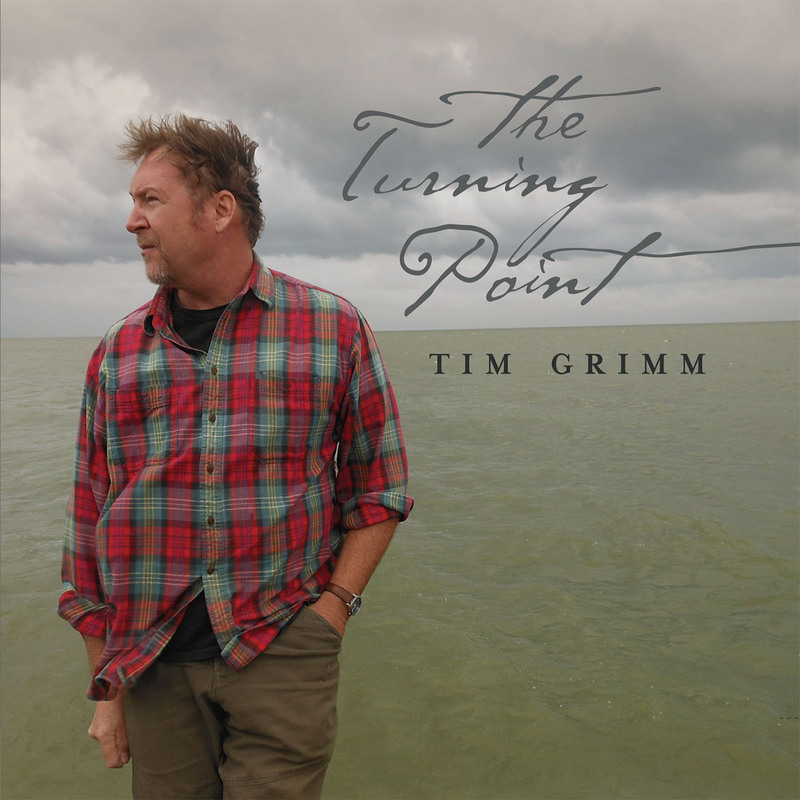 By the way, the Tim Grimm picture on the cover of The Turning Point CD was taken on the afsluitdijk. Back on the buses and off to Leeuwarden, the capitol of Frisia. In this area they have their own language. Leeuwarden or, in the Frisian language Ljouwert, has a lovely and very walkable old centre with a fantastic museum – The Frisia Museum. Nearer the start date of the tour we’ll advise you about what special exhibition they’ll have and obviously get you tickets to visit that exhibition. I guess it will be about 4 pm when we jump on the buses again. Next destination is our hotel for the next 2 nights. Today we’ll be visiting the fortress of Bourtange where a lovely lady will show you around. In 1580 William of Orange gave the order to build a fort on the sand ridge in the Bourtanger moor, on the border of modern Germany. On the order of William Louis of Nassau the fortress was raised in 1593. Between 1593 and 1851 Bourtange was an important fortress. An agrarian village came into being when the fortress was dismantled in 1851. Only a few buildings still remembered the glory of yesteryear. Between 1967 and 1992 the fortress was reconstructed. The ramparts were again raised, ditches were dug and soldiers’ barracks were built. Visitors of present day Bourtange believe themselves to be back centuries in time. Meet the fortress which has never been taken … Maybe we’ll see you in the year 1742. We are taking it easy in Bourtange. After the guided tour you have time for a bite of lunch and visit the synagoge and / or other attractions in this cute fort. Or just wander around. Then back on the bus and on the road again. We’ll be our way to legendary music pub ’t Keerpunt (aka The Turning Point). But along the way we’ll have a look at an Hunebed. 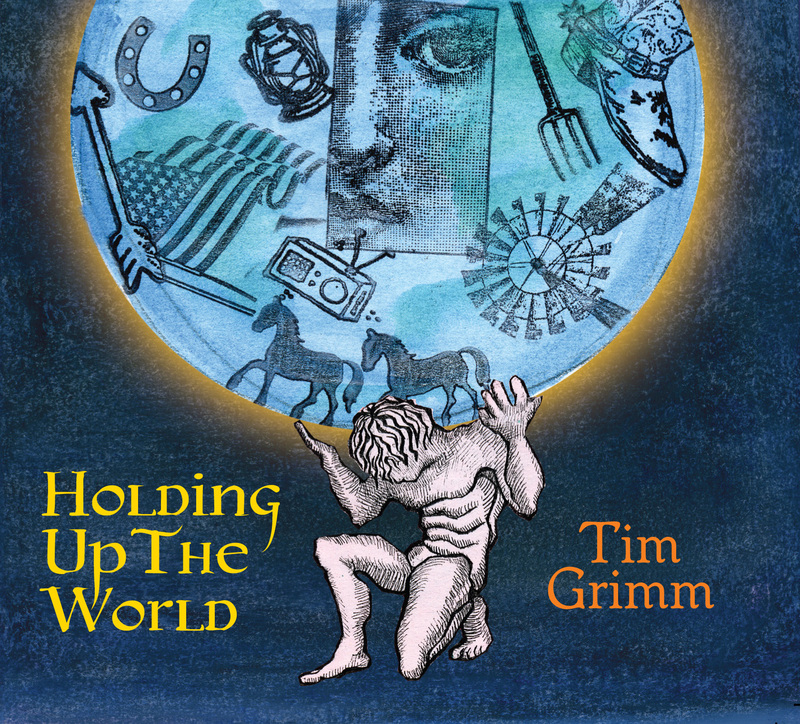 ’t Keerpunt, yes, indeed, the place that named Tim Grimm’s brilliant 2013 album. This is the place where the German soldier, who murdered the vicar, was chained to the wall. You know all the details from the title song. 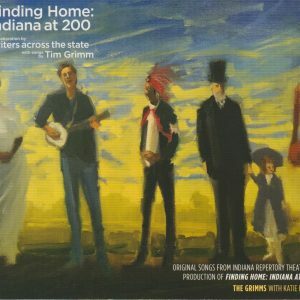 Somehow we’ll find a room for a Tim Grimm and Jan Lucas concert specially for us, so we can hear the song where it happened. Checking out today of the hotel and leaving timely for a trip to and a trip through Giethoorn. The village Giethoorn is called ‘The Venice of The North’ and with about 2.620 habitants is unique in the Netherlands because of its bridges, waterways and ‘punters’ (typical boats from Giethoorn). You see 18th and 19th century farmhouses hidden between the trees and wooden bridges. Of course this should be viewed from the water so we’ll hire a couple of so-called whisper boats (electric engines) that we drive ourselves through the canals of the village and the lake nearby. After our visit to Giethoorn we continue to our next lodgings in or near Apeldoorn in an area called “National Park De Hoge Veluwe” (The Hoge Veluwe National Park), one of the largest continuous nature reserves in the Netherlands. The park De Hoge Veluwe was established by the businessman Anton Kröller and his wife Helene Kröller-Müller as an private estate in 1909. Helene Kröller-Müller was an art collector and started building an art museum inside the park. Due to worsening economic conditions the building of the museum was halted and the couple found themselves unable to keep the estate. In 1935 the art collection was donated to the State of the Netherlands, which then continued to build the Kröller-Müller Museum, one of Netherland’s most interesting art museums and the main act on our program today. The Park / Museum grounds cover 5,500 hectares of woodland, heath, grasslands and shifting sands. On foot or on the White Bicycles, provided by the museum you are free to roam around in nature, to naturally arrive at the museum itself. The Kröller-Müller Museum boasts the second-largest Van Gogh collection in th e world: almost 90 paintings and over 180 drawings. The Van Gogh Gallery displays varying selections of about 40 works by Vincent van Gogh. Furthermore, you will also find masterpieces by modern masters such as Claude Monet, Georges Seurat, Pablo Picasso and Piet Mondriaan. In the sculpture garden, one of the largest in Europe, you can enjoy both sculptures and nature. Distributed throughout the garden are over 160 sculptures by iconic artists, from Aristide Maillol to Jean Dubuffet, from Marta Pan to Pierre Huyghe. Your last hotel is about 75 minutes drive from Amsterdam Airport. So if you decide to return to The States on Monday September 17, please do not book an early morning flight. You are expected to be at the airport at least 2 ½ hours before depature of a trans-atlantic flight. So that roughly means leaving the last hotel 4 hours before departure of your flight.